While the Annapurna Circuit remains ever-popular despite the jeep track that’s been built alongside some of the trail, there are still some unspoiled areas in the higher parts of it. These are perfect destinations for an adventurous mountaineer. 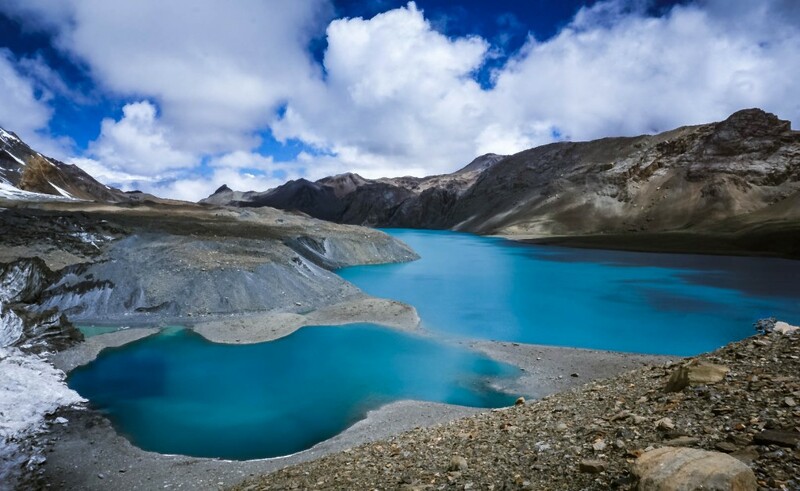 Between Jomsom and Manang lies the beautiful Lake Tilicho, at 4900 metres. It is a remote place, surrounded by glaciers and landslides. 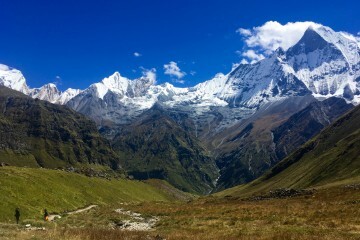 It is fairly common to go to Tilicho as a side trek of the Annapurna Circuit. What is less common, and often discouraged, is to cross on the other side, all the way to Jomsom, via Meshokanto Pass. 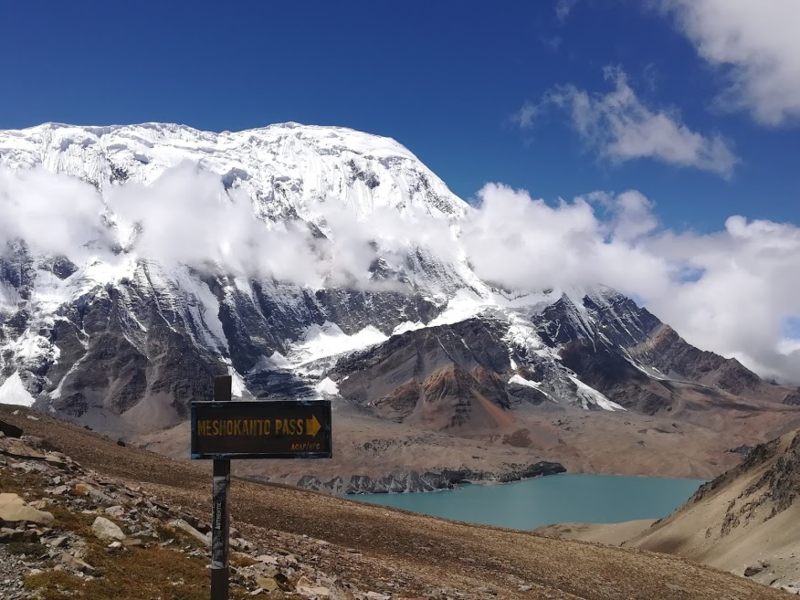 This means that from Tilicho Lake, instead of going back on the main Circuit trail and crossing the well-known Thorong-La, you continue along the right shore of the lake and cross somewhere lower and further south, reaching Jomsom directly. This is a challenging trek and you should not attempt it without a guide or a GPS, as well as good orientation and mountaineering skills. 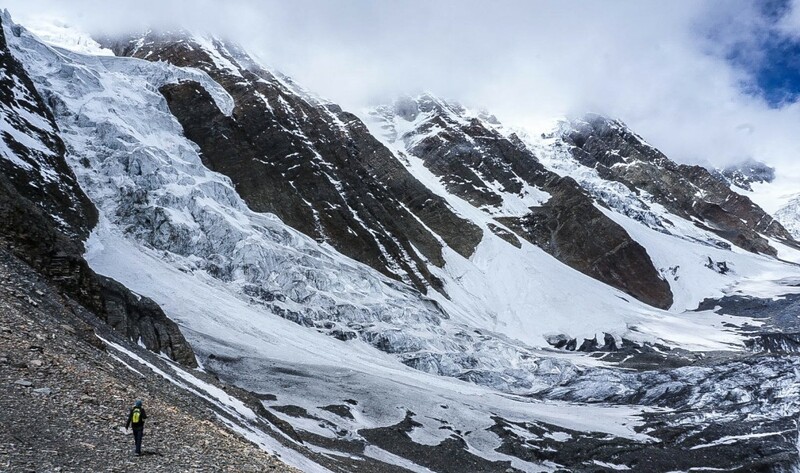 It is also not advisable if there is a lot of snow or rain, as it becomes very slippery, landslides are common and the trail becomes very hard to find. 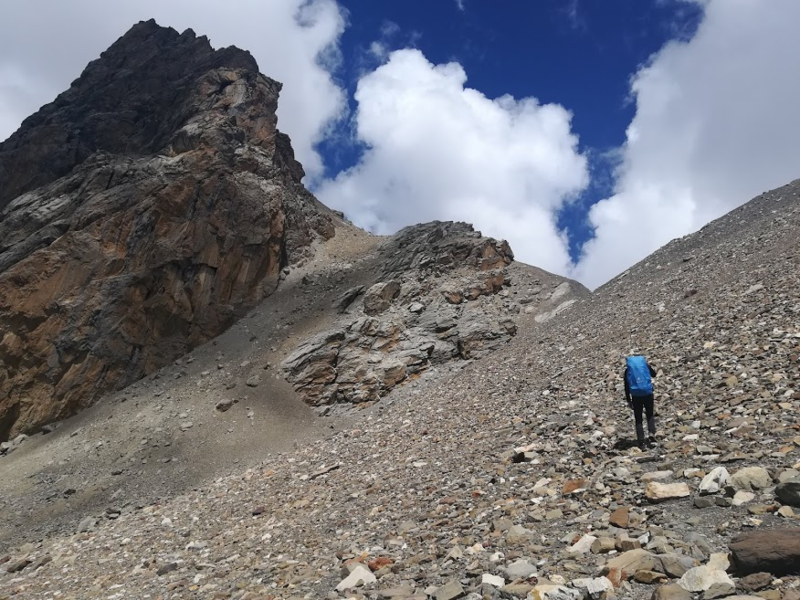 A possible itinerary is to trek the normal Annapurna Circuit to Manang, head to Tilicho Base Camp via a well-marked trail, then cross the pass and reach Jomsom. From there, either continue downhill towards Marpha or fly back to Pokhara. An alternative route is to fly to Jomsom from Pokhara, spend a couple of days acclimatizing and then cross towards Manang. From here, either continue downhill on the classic Annapurna Circuit trek or go uphill, cross the Thorong La and get back to Jomsom. 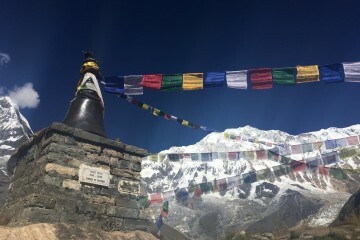 While it can be done both ways, if attempted from the Jomsom side, it is mandatory to take a few acclimatization days and go towards Muktinath and the Thorong La first. From Tilicho Base Camp to Jomsom you can walk in one (very long) day. From Jomsom to Tilicho Base Camp, at least one night of camping is necessary as the climb is very long. In either direction, the best way to do it is with camping gear and one overnight stay in tent. There are no teahouses between Jomsom and Tilicho Base Camp. You can hire equipment in Manang or Jomsom if you don’t have your own, but don’t expect great quality or lightness. For this reason it is advisable to also hire a porter, who can help you carry the extra load at such a high altitude. Friends of mine trekked it coming from Manang and crossing towards Jomsom. They walked for 12 hours with few breaks. It is fairly easy to reach Tilicho Lake as the trail it is well marked. Most of the uphill is in this first part of the trek, as you climb from 4200 metres to almost 5000 metres. Beyond the lake the trail is faint and difficult to follow. You must go around the lake on its right shore. Here and there the trail is marked with poles. You must climb up a ridge at around 5300 metres. From this point, the trail is marked with cairns and it goes down into the valley, from which you need to climb another hill. The climb is only on scree slope and you should be very careful with your steps. It is not a good idea to do it during heavy rain or snow. 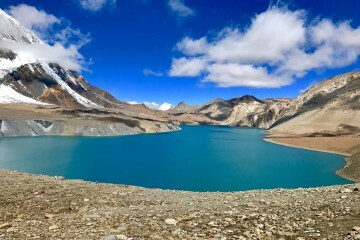 From Tilicho Base Camp, the pass can be reached in about six hours from Tilicho Base Camp. It is marked with a big cairn. After the pass, the way it is mostly downhill but still not easy to follow, as markers are missing or scarce. If you seek adventures in remote places then this is definitely a worthwhile trek, as you’ll find few other people here, if any. Make sure you get as much information as you can beforehand, take at least one trusty friend with you or a local guide. I am a Romanian traveler and explorer in love with nature, especially mountains. I adore camping and hiking. The place where I feel home seems to be Nepal's Himalayas. I keep coming back here even though I have lived in 6 countries on two continents.